I’m really excited to launch a new project that has been in the tubes for a little while now, called Think Synergy. The aim of our new company is to provide expert tuition in surfski paddling, backed up by core fundamentals of strength and conditioning, with a focus on wellness. For several years now I’ve really wanted to get into the space of bringing new people into the sport of paddling, as well as help those already enjoying the sport to improve. However, my work as a fire fighter has meant that I have not been able to commit to a timetable to cater for running regular sessions. 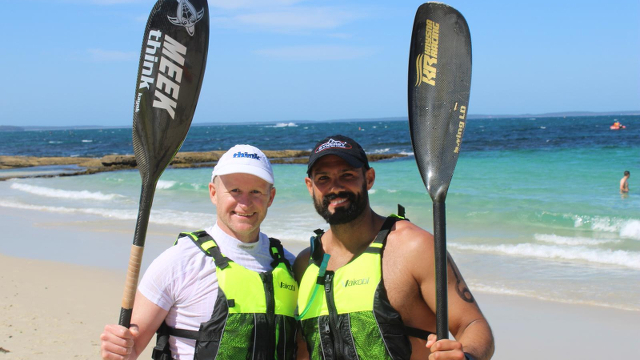 A chance discussion with Doug Peres, a highly qualified and experienced PT who runs a business called Synergy Adventure Fitness, who is also a keen paddler, and the idea was born to come together to deliver surfski sessions on iconic Sydney Harbour. Think Synergy is the amalgamation of our passion for paddling and fitness. Think Kayak Global have been a fantastic support, and our skis of choice to start our new project are the new Zen. Our inventory also includes PowerWing paddles and PFDs from Think. Think Synergy is based in Rose Bay, and our sessions cater for up to 10 paddlers at a time. We believe that this smaller group size ensures we can provide excellent instruction to paddlers, and also ensure safety. Over the past two months we’ve been running sessions and getting a feel for what our clients want and need from us as instructors, as well as working out various aspects of logistics and safety. We’ve had an absolute ball on the water, and the improvement in the abilities we’ve seen have been fantastic. We’re very excited to now be able to launch fully, and offer sessions over three mornings per week, Monday, Wednesday and Friday. Sessions are at 6am for 1 hour, and the plan is to expand these to a second session at 7.15am on the same mornings. If you’d like to get involved, or have friends you’d like to introduce to the sport, please do not hesitate to get in touch and we can get you on the water and show you what this sport is all about. And if you have your own ski already, that’s cool, you’re more than welcome to join us. We also have the capacity to run team building corporate days, so if your company are looking for an exciting outdoors activity, we’ve got you covered. And speaking of corporates, we’ve got sponsorship opportunities with our fleet of skis and equipment. What better way to showcase your brand by having it on Sydney Harbour every morning, seen by thousands of ferry commuters and exercisers, with paddlers getting their morning training session in, as well as being captured and shared in photos and video on our social media streams? If you have any questions regarding Think Synergy, and how we can help your paddling, drop us a line, we’re only too happy to help. Give our Facebook page a like to get stay up to the minute on happenings at Think Synergy.